By now, most social media marketers (and users for that fact) are aware of Facebook's new "Reactions" feature, which makes the news feed a lot more expressive with various “reactions” available in the form of emoticons. Aside from liking a post, users can post other reactions too. Facebook has launched five different reactions including like, love, Happy (HaHa), Wow, sad and angry. Since users are now used to these reactions, developers may want to consider adding them to their WordPress posts to enable visitors to provide value and rapid feedback about the articles. Since we often don't get to share facial expressions online, reviews and feedback can sometimes be difficult to interpret but emoticons may lend a hand. They allow Web users to share their facial expressions as well as website owners to rightly interpret the reviews. A majority of visitors come to your website, read a post and leave without ever leaving a comment or feedback. This can be because the lengthy process of registering or logging in to your website commenting system. This makes it very difficult for the website owners to understand whether their visitors like the information provided on their site or not. However, adding emoticons to your site encourages visitors to leave comments or share their reviews about the post simply by clicking on an emoticon. An emoticon is a great way to establish good communication with your followers and fans. When a person looks at an emoticon on the Internet, it has been suggested that the person feels as if he/she is looking at a real human face. This gives them real-life user experience on your site and makes them a returning visitor. Unfortunately, this new Facebook feature is still not made available for WP sites on the whole, but it can be availed with the help of a plugin. DW Reactions plugin allows you to add the reactions feature above or below the content of your posts as per your needs and preference right from your WordPress admin panel. The plugin makes use of the UX design of FB to allow visitors have great user experience on every Internet-enabled device. The plugin also allows you to use PHP function dw_reactions() or shortcode to show reactions button and counting for your WP theme. Open your WordPress dashboard and click plugins → add new. You will be redirected to a new page where you will see a search box in the right corner. Search DW Reactions in the search box and hit enter. Click “install now” to install the plugin and activate once installed. Once activated, you need to configure the plugin via Reactions' setting page. Click Setting → Reactions and you will be redirected to Reactions settings page. 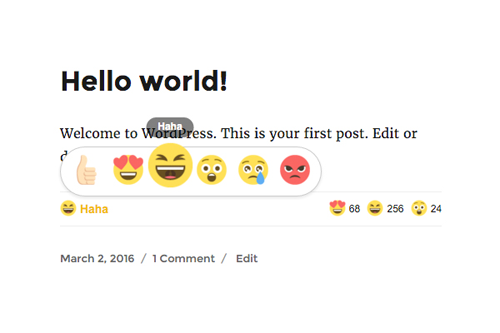 The page includes a variety of options to configure and to add reactions to your WordPress posts, check the boxes beside Show reactions count options and Show reactions button. The settings page has other options that allow you to choose the position where you would want to display the reactions button. Check “show the reactions button above the post content” to display them above the content of your post or check “show the reactions button below the post content” to display it below the content. Check them all if you want to display the button on all of the above pages. By default, DW Reaction plugin allows only signed in and registered users to post reactions on your WordPress posts, however, you can change the setting by unchecking the “Users must be registered and logged in to add reaction” option. Hit save to save all the changes you have made in the settings of the plugin and visit your site to check if the plugin works or not. If, in case you do not want to show reactions button on every page, you would need to uncheck the first two options in the automatic display section on the settings page. Once disabled, you can make use of [reactions] shortcode on the selected pages to show reactions button. Emily Johns is a WordPress Developer by profession and writer by hobby. She works for Wordsuccor Ltd., a custom WordPress plugin development company based in the U.S.. If you need to hire a WordPress Developer connect with her on Google+, Facebook and Twitter.